Maria Sharapova is a Russian tennis star with four grand slam titles under her belt. She has taken Wimbledon, the French Open, the US Open and the Australian Open. Not only a talented player, this leggy 6′ 2″ stunner has modelled for many of her endorsements, and her looks have seen her appear on the cover of Gent’s magazines and the highly-acclaimed swimsuit issue of Sports Illustrated. Sharapova is known for liking the 911 Carrera. In fact, she owns more than one, but it’s this white model she is frequently spotted driving. 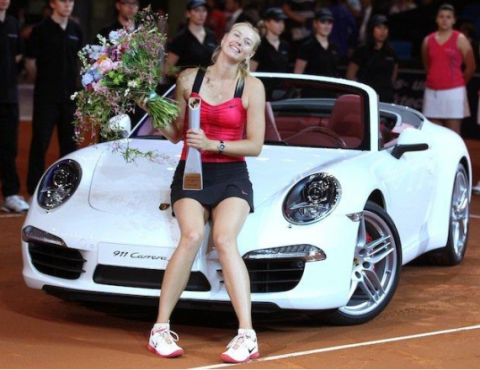 The Russian beauty took the $130,000 car after winning the 2012 Porsche Tennis Grand Prix.